There has been a great many things said about the benefits of playing scales and exercises by many eminent musicians over the years. I do quite like Barney Kessel’s sentiments on the topic, “playing scales is like a boxer skipping rope or punching bag. It’s not the thing in itself, it’s predatory to the activity.” I think in many ways this quote sums up the aims of this book, its intention on developing the facility and techniques found in real playing situations. In my dual capacity as an educator as well as a player when I received the book I decided to try a selection of the exercises on some of my (more advanced) students. This isn’t a book for the faint hearted; some of the exercises are very difficult indeed. Michael Anthony has worked as a freelance guitarist and has played and recorded with artists as eminent and diverse as Tony Bennett, Nelson Riddle, Henry Mancini, Quincy Jones, and Peggy Lee etc. His main mentors were Jimmy Wyble, Howard Roberts and Tommy Tedesco. 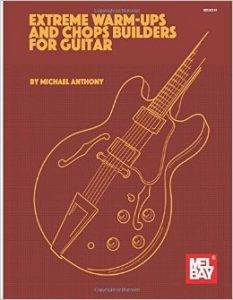 A number of the exercises in this book, particularly the chord melody ones clearly show a Howard Roberts influence. The book begins with a number of arpeggio exercises and patterns. Michael offers advice on adapting and expanding the exercises as well as effective ways to pick them. Chord melody studies are interspersed with the aim of developing left hand stretching as well as techniques such as voice leading, contrary motion and inner voice movement. There are thirty-seven exercises presented although each has a series of variations attached. So the verdict by my students and myself. All favorable and the benefits are already becoming noticeable in their playing (and mine). This is a book of difficult yet well thought out exercises. All the techniques discussed can be applied to or can help towards develop the facility for real life playing situations and I particularly like the mixture of single note exercises and chord studies. I would definitely recommend this book and shall continue to work through it as well as use elements of it in some of my lessons. Copyright © 2017 Huddersfield Jazz Guitar Society. Created by the team at Visutech Design Limited.